Are you in need of a new graphics card? If so you may want to consider Newegg's "Shell Shocker" deal for the day. 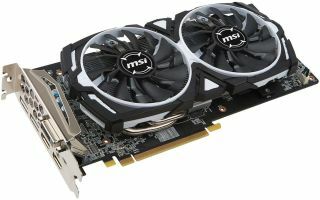 While these are not always scintillating bargains, today's is really good—it's for an MSI Radeon RX 480 Armor 4G OC graphics card for $160, down from its normal selling price of $210. The discounted price includes a $25 mail-in-rebate. Without the rebate it's on sale for $185—that's still pretty good, but it's the after rebate price that makes this one worth giving a heads up. Note that this is the 4GB model, not 8GB. MSI also sticks to stock clocks here with a 1,120MHz base frequency and 1,266 boost clockspeed. What's different versus the reference design is MSI's dual-fan custom cooling solution dressed in black and white. MSI promises lower temperatures and quieter operation compared to AMD's reference cooler. When we reviewed the Radeon RX 480 last June, we noted that it was not the fastest AMD had to offer but was a "great card for $200." The field is a little more competitive now, but even so, $160 for a custom cooled card is not too shabby. You can grab the MSI Radeon RX 480 Armor 4G OC here.